Phytoplankton, including their direct predecessors, are present on our earth for about 3.5 billion years. It is common knowledge that they have altered the primordial atmosphere by adding oxygen to it, hence, they made our planet a habitable one for all those organisms that require oxygen. 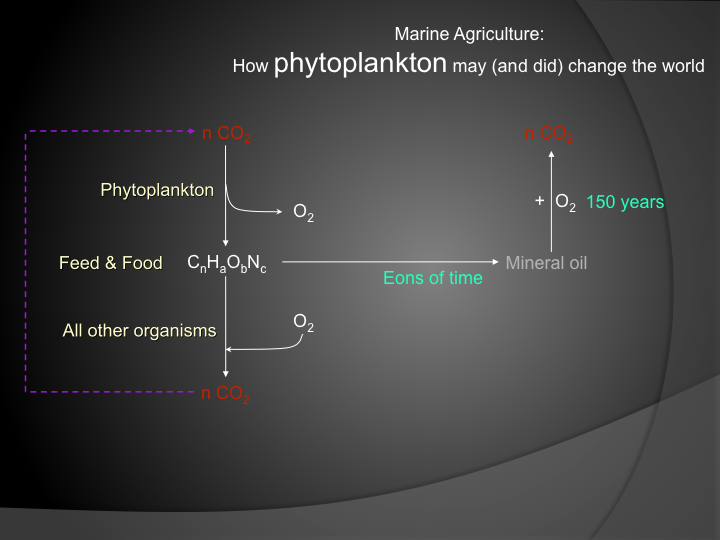 Last year, when I prepared a presentation for a conference, I had an idea to include a few words on the global power that algal photosynthesis had in the past, and extended it with a few steps to relate phytoplankton to our current climate problem. The process of photosynthesis by phytoplankton cells took the carbon dioxide from the atmosphere, direct, or indirect by taking it up from the sea water. It was used as building blocks to make organic material, shown as a chemical formula (resembling sugar, I omitted many atoms for simplicity) in the slide below. At the same time, a bit more than one oxygen molecule was released into the atmosphere in exchange for every carbon dioxide molecule. We know the result, the atmosphere contained more and more oxygen….but equally or even more important, there was more and more organic material present which could be used by other organisms, that were not able to photosynthesize, to provide biological building blocks and energy. All in all, everyone was happy (I guess). The sun provided energy, the atmosphere had plenty of carbon dioxide, the phytoplankton used it to make more copies of themselves and released oxygen and were available as feed, and the other guys consumed the phytoplankton biomass and used the freely available oxygen…Ah, I forgot to add one important element, the feed consuming organisms not only consumed the oxygen, but also released carbon dioxide. A cycle was created! From a systemic perspective, an earth like this could go on forever, as long as the sun provides energy to keep the merry-go-round in motion. 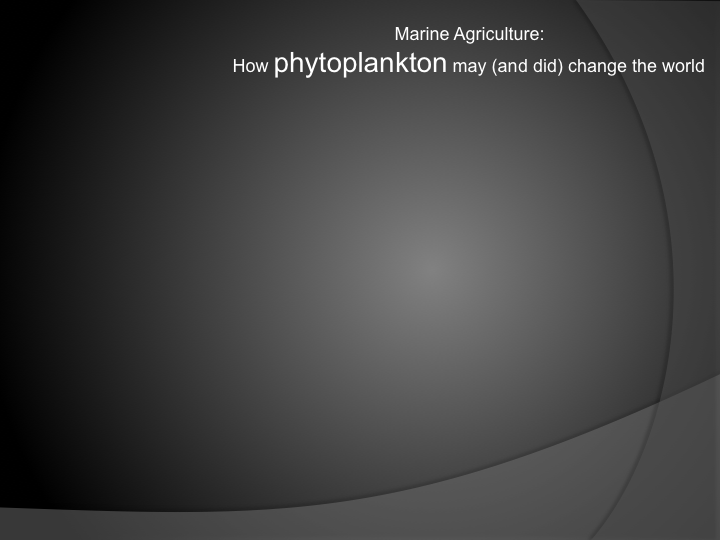 But: not all phytoplankton participated in the game of being eaten. Some of them (then, as some of them do today), evaded this cycle; well, they did not really evade it, they simply sank down to the deepest parts of the oceans without being eaten. There, lying on the bottom of the dark, cold ocean, compressed by tons and tons of water pressure, they lost the identity of being cells, but their organic molecules remained largely intact: crude mineral oil. …at some point a special life form emerged a few million years ago. The most beautiful creation so far, mankind quickly learned how to better protect their species against others and against the challenges imposed by nature. But only 10 thousand years ago did the life form man organize itself into larger groups, and started to build the first blue prints of societies with different cultures. They learned to use the same what the other primordial organisms had learned, namely eat what you can find in your environment, and make energy from the material in your environment. he societal development went relatively slow (as measured by current standards), but at some point about 150 years ago, the social development accelerated with the speed of light: fossil fuel was found and there was plenty of it, and by burning it, a lot of the carbon dioxide came back into the atmosphere. Oops. take any process, simple or complex, small or large, chemical or physical, or biological or social for that matter, and create an imbalance to that system by taking something out or putting something into that system a million times faster than the most characteristic process of that system and I think that nobody expects to see that system continuing as usual. You will expect something like a big bang, or a dramatic slow down, or a complete change of such a traumatized system, but you do not expect it to continue as if nothing happened. This is what I think we might call our real problem (climate change is just one measurable phenomenon), which is, a dramatic mismatch in rate of processes, one of which we have introduced by burning fossil fuels at the rate we have done. Should we be worried. I think, YES, we should, it doesn’t really harm to be worried. Being ignorant and inactive can be damned painful. Worries provoke creative thoughts. Humans are good at that. And sometimes, the solutions are so easy (which is not the same as saying that their implementation is easy). So it might be a good idea to make the merry-go-round running again. 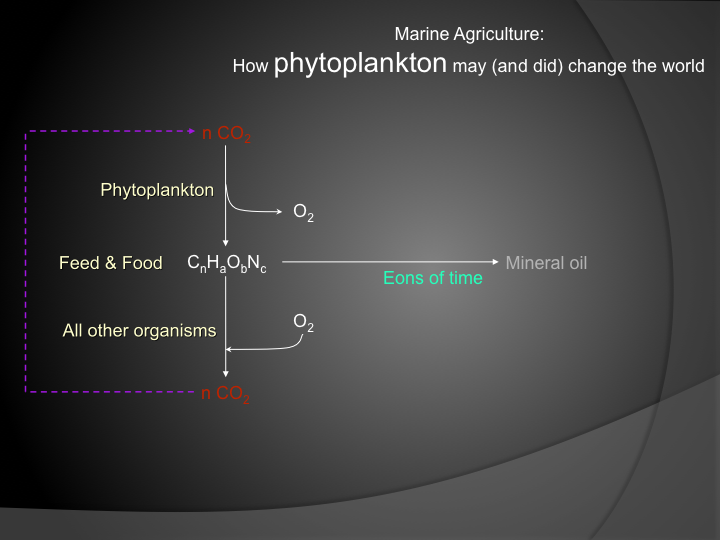 It might just be a good idea to make phytoplankton grow in land based systems, in deserts, where only 2 % of all subtropical deserts are needed to restore the balance between the two flows of carbon dioxide. 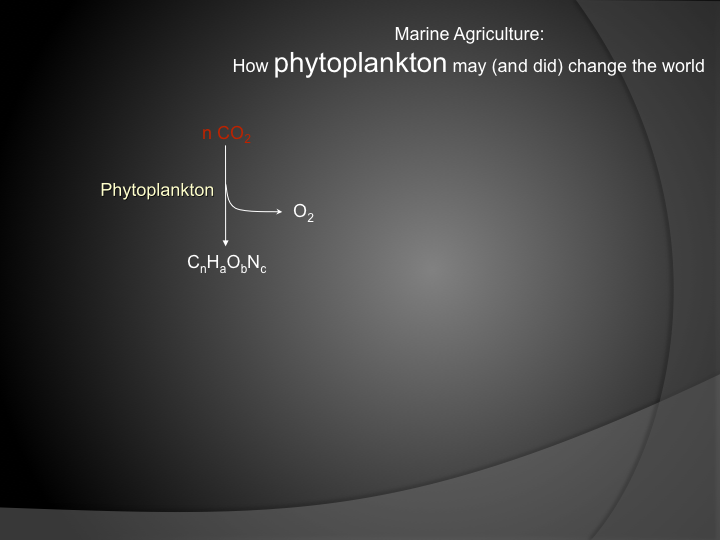 It might just be a good idea to increase the application of phytoplankton as feed and food – creating resources for the next 3 billion people that will want a seat on the merry-go-round. 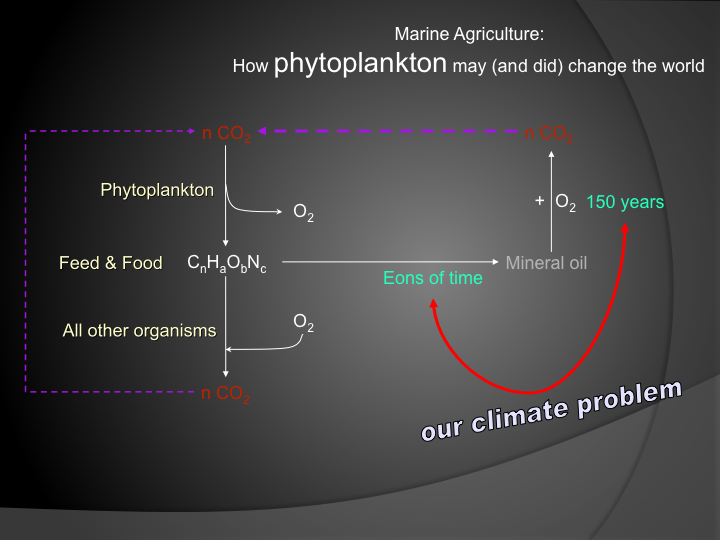 ……………..It might just be a good idea to implement Marine Agriculture on a global scale.